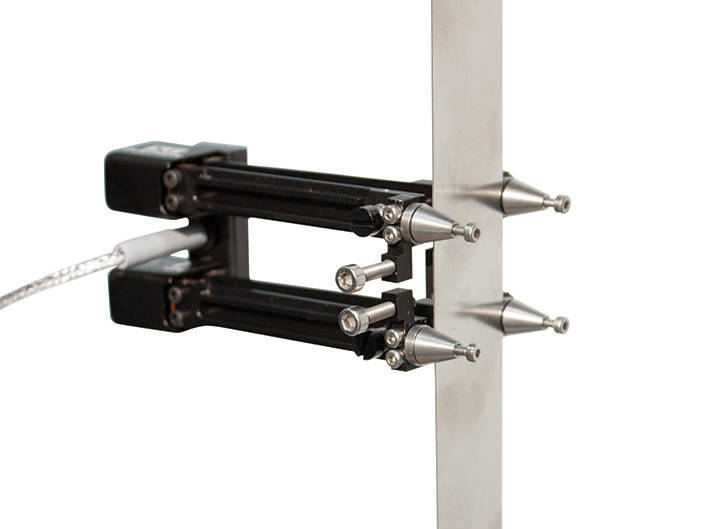 Transverse Averaging Extensometer with single channel output for attachment to thin rigid specimens, 0.3 mm to 4 mm thick. Accepts specimens from 10 mm to 20 mm wide and from 15 mm to 25 mm wide. Suitable for ´r´ and ´n´ testing on sheet metals. Requires suitable axial extensometer of 50 mm gauge length minimum for ´r´ value determination. Requires single strain conditioner. Catalog Number 2640-010 The 2640 series averaging transverse extensometer is designed to measure average transverse gauge length and strain with a single output channel.